ASUS ROG Maximus X Hero Review – WE’VE ALWAYS TENDED more towards Asus’s Prime series motherboards than its ROG Maximus range, largely because the latter are invariably far more expensive. With the release of Intel’s Coffee Lake CPUs and accompanying Z370 chipset, it seems that won’t be changing any time soon: the ROG Maximus X Hero, more than the Prime Z370-A we’ve seen in a few PCs. To be fair, ROG Maximus motherboards have always offered more than a scarier- sounding name, and the ROG Maximus X Hero particularly excels in cooling support. There are a full eight 4-pin headers scattered around, including one dedicated watercooler pump header and one with H-Amp support for more powerful fans. Additionally, water in, water out and water flow headers are included near the bottom-right corner. 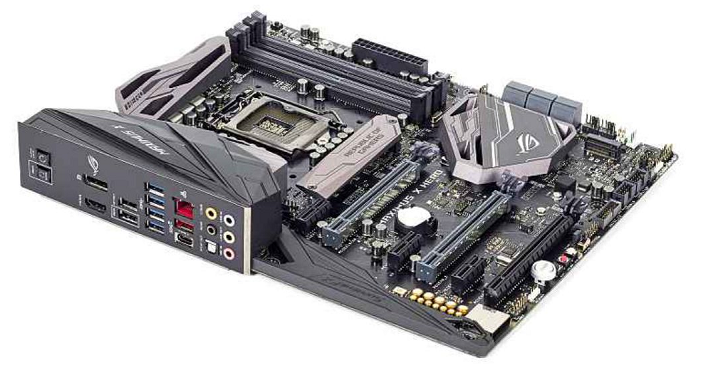 Prime motherboards typically only cater for some extra case fans and all-in-one water coolers, so this motherboard’s wealth of connectors will well-serve any PC build with an extensive open-loop liquid cooling system. There are lots of other useful inclusions, too. The two-digit POST code display is incredibly helpful for troubleshooting, especially in cases of failed boots, and there’s also a MemOK! button, which can attempt to automatically fix DRAM issues. The other onboard buttons – power, reset and safe boot – are also handy when tinkering with the case open. Further evidence of the ROG Maximus X Hero’s enthusiast aspirations can be seen in the high memory overclock limit of 4,133MHz and glowing RGB lighting, with support for additional, individually controllable LED strips available via headers. The integrated I/O shield adds to this visual flashiness even further. Happily, one of the two M.2 slots comes with a heatsink, which can cool it somewhat to prevent overheating and keep speeds high. 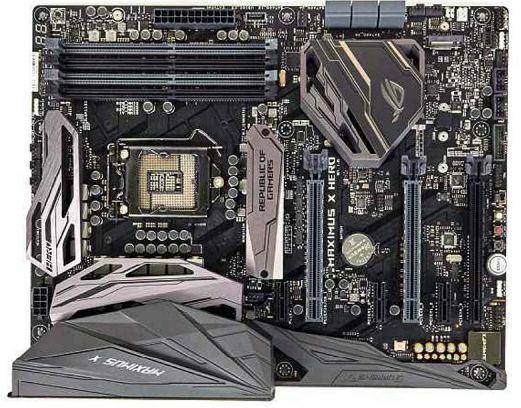 You can find this feature on cheaper motherboards, but Asus has been wiser here than on the Prime Z270-A: unlike on that motherboard, you can easily detach the heatsink by itself, without the need to remove the entire PCH heatsink as well. Besides these two M.2 slots, you get a good mix of expansion opportunities, with four DDR4 RAM slots, six SATA ports, three PCI-E x16 slots and three PCI-E x1 slots. Both two-way Nvidia SLI and three-way AMD CrossFire multi-GPU setups work, but this won’t mean every slot runs at full x16 speeds: if filled all at once, the top two slots will max out at x8, while the bottom can only hit x4. The I/O panel isn’t utterly rammed with ports, though it’s far from short on them either. The total of eight USB ports are split between four USB3, one USB3.1, one USB Type-C and two USB2 ports, with a Gigabit Ethernet port, one HDMI output and one DisplayPort along for the ride. Audio connections deserve a special mention: besides the usual line in, line out and mic in 3.5mm jacks, Asus has added C/SUB and rear speaker jacks, plus an S/PDIF port for high-grade speaker setups. 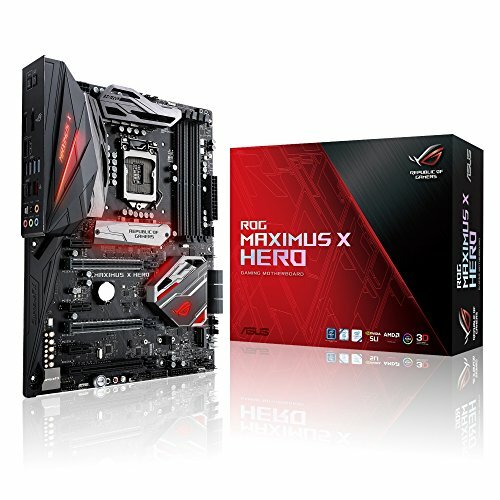 We were pleased to find the ROG Maximus X Hero running an up-to-date audio codec, as some motherboards skimp on this aspect: it’s the ROG SupremeFX S1220, which is based on the recent Realtek ALC1220 codec. For the price, this motherboard’s hardware is almost entirely spot on, with a couple of exceptions. The first is a small thing: there isn’t much metal reinforcement of the plastic expansion slots, with only two of the PCI-E x16 being given the treatment. 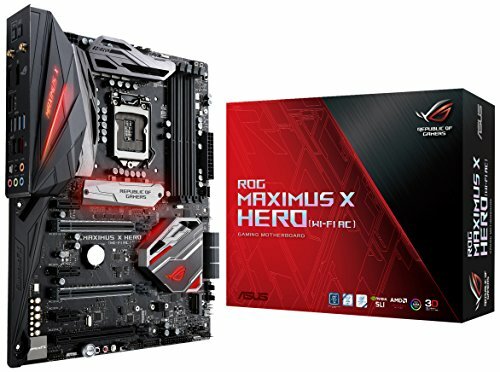 The second, more unfortunate, omission is Wi-Fi as standard; you can get a version of the ROG Maximus X Hero with 802.11ac built in, but this pushes the price further, which is a bit excessive for a Z370 model. On the spec we tested, it’s completely absent. On the bright side, this is a fine motherboard for overclocking. We swapped our Intel Core i5-8600K benchmarking chip for a Core i7-8700K, on the grounds that its higher clock speeds and core count would make for a more strenuous test, but the ROG Maximus X Hero wasn’t fazed. With our usual 240mm AIO watercooler, we easily got this 3.7GHz chip up to a stable 5GHz, with 5.1GHz being possible for light usage but crashing during the highest loads. We have seen the Core i7-8700K run comfortably at 5.1GHz, in the Overclockers Renda G3-CS, but the silicon lottery means there’s little point in splitting hairs over 100MHz. Asus’s UEFI BIOS isn’t as easy to navigate as MSI’s, but it’s packed with options for fine-tuning CPU and RAM speeds, and isn’t exactly difficult to find your way around. Inexperienced overclockers should avoid the EZ Tuning Wizard, however; we sometimes find these ‘instant OC’ tools a bit timid in how much power they add, but here it pushed the Core i7-8700K to 5.15GHz, which proved too much to avoid crashing under load. Still, this is a serious motherboard for serious PC builders, and when playing to its strengths of manual overclocking and open-loop water-cooling support, the Asus ROG Maximus X Hero looks like a smart purchase.